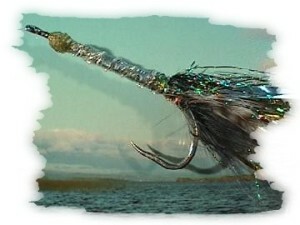 To catch Pollack and mackerel off the rocks is exquisite fun, especially on a fly rod. The only special item to do this is a fast sinking line. The fish are not very choosy, anything with silver and a bit of red works. Hooks should be stainless steel or zinced in sizes 2 or 4; the Salty fly is easy to tie, easy to cast ( a class 8 rod manages two without any problems ) and catches very well. It is a very special and joyful adventure to catch mackerel or pollack on a streamer, but don't forget to clean off the salt residue from the tackle afterwards. The fly can be finished off with a drop of red varnish or, to give it extra strength, with a drop of super glue. Though he had caught a nice salmon, the day's highlight was something else: there was this guy, he told the landlord of the B+B he was standing in, must be a Pakistani or something, had this funny hat on, thick beard and looked very tanned, anyway, he was fishing the left bank below the bridge at the football field. The landlord listened smiling to his guest's story, went to the pub that evening, where, by pure chance, he met the treasurer of the local anglers association, tell me, he asked, do you know of any Pakistanis fishing the river? Well, I've got this man from the North staying with me, you know, and he saw this feller, a Pakistani probably, hooking a really big salmon on the fly, he played it for a very long time, you see, was actually ready to net it. The treasurer, after hearing the whole story, said that he didn't know of any Pakistanis at the river at all. Had two more pints and went home. Fishing the next day, he met a colleague at the river. Of course they had a lengthy chat, and, finished the treasurer, this bloke, this Pakistani, he had the monster actually over the net already, when it came off and he threw the rod, net, hat ‘n' all on the ground and started cursing in this weird language, maybe he thought nobody would hear him. The angler was amused by that story, fished until evening and then went on to visit a well known angler of the region of German origin: bearded, well tanned since he spent more time outdoors than indoors, often seen with rather unusual head gear. And I lost him, the well known angler of the region of German origin came to the end of his story, just couldn't get the net under him. If only someone had been there to help me, but of course, as always in such situations, I was all alone. And then, when it came off, I threw everything down and started swearing and cursing, in German of course: Verdammter Mist, Scheisse and so on. Gees, the Pakistani, it dawned finally on the two men; resolving the story was easy now. From now on in, laughed the well known angler of the region of German origin, they can call me El Pakie!